The Philippines’ Coconut Capital, Davao Oriental, is a province in the region of Davao that faces the Philippine Sea on the east. With Mati as its capital city, Davao Oriental boasts of many wonderful natural tourist attractions including gorgeous beaches, falls, islands, parks, forest, spring, etc. 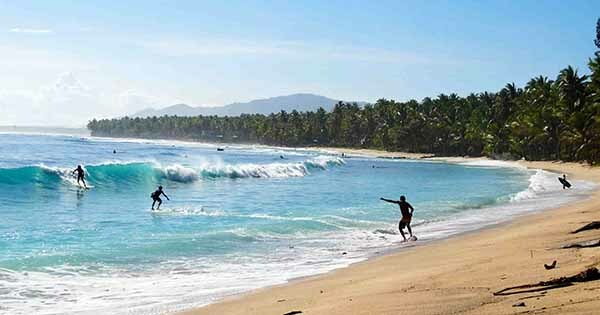 #1 - Dahican Beach (Mati): Calling on all beach bums and bunnies out there – whether young or old! Wait no longer and then go after what pristine Dahican Beach has to offer! Comfortable accommodation, Boracay-like powdery white sand, shimmering clear turquoise water, fun skim-boarding in addition to surfing, diving, ultra-flying, plus many more! #2 - Aliwagwag Falls (Cateel): Come and see the beauty of enchanting Aliwagwag Falls! Now, with an even more interesting addition, Aliwagwag Falls also has an eco-park that provides entertainment for all adventure-seekers who love riding the zip line (so fine with its 680-meter stretch over the Cateel river) ; on top of walking on a monkey bridge, picnicking, bathing in the falls, taking awesome shots, etcetera. #3 - Sleeping Dinosaur Island (Barangay Dawan, Mati): Would you like to wake up the Sleeping Dinosaur Island with your cheerful noise and upbeat voice, now! This charming island that is shaped like a Plesiosaur will definitely wow you and your buddies with its refreshing landscape, deep blue ocean water all around, a mountain peak where you can see a stunning view of it, a calm and sense of peace as the ocean breeze come touching your face, and lots of souvenir photos you can bring home with you – so just snap, snap, snap away! #4 - Subangang Museum (Surigao Davao Coastal Road, Mati): as you hit the road, be on the museum mode because of the treasures over at Subangang Museum! Moreover, for nature’s sake, do a double take of this enthralling museum’s Davor the whale! It is no less than the 53-feet fossil ized remains of a 20-ton Sperm Whale that died at the coast of General Generoso a few years ago. What is amazing about this whale exhibit is that it is known as the 7th largest in the world, and a first in our country. #5 - Mindanao Saga Flying Club (Barangay Dahican, Mati): Of all the daring things you can do in the sky, you should definitely not fail to try flying an ultra light aircraft with an expert pilot over at Mindanao Saga Flying Club! That is especially if you have got a fascination for riding airplanes, helicopters, etc. and just having that picture perfect sight of the captivating places in Davao Oriental from a bird’s point of view. Don’t you be shy now, fly high, up, up in the sky!